(aka “the Stone”) has three internal trap circuits (Microwave, RF and Electric Field) to absorb the broadest spectrum of EMI. Placement on automotive CPUs has measurably increased engine horsepower. It also improves resolution for virtually all-major components in high definition audio/video systems. Music reproduction is clearer, with more liquidity, dynamics and focus. The improved inter-transient silence allows the listener to hear ambient cue information essential for accurate perception of stage depth, width and unwavering imaging. High quality video systems will benefit from SHAKTI devices near power supplies, projection guns and laser disc/DVD players. Reduced color noise and improved convergence alignment are some of the improvements that can occur. In automotive applications, where space allows, the unit should be securely taped and/or cable tied to the top of the CPU. 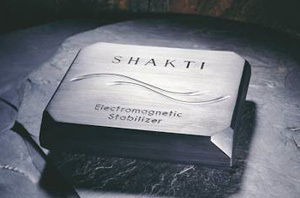 The new improved Shakti “AIR” Stone is designated with a gold embossed word, AIR, on the top. This is the first modification to the Stone in over 20 years. It contains new, additional circuit material that grabs even more distortion. Beta testers have universally praised its even more audible benefits when placed on components. The Stone¹s proven capacity to reduce EMI is much greater, giving the listener a cleaner, more musically accurate playback of his recordings.